Home › Pix of the Trade › Love is in the air! Love is in the air! 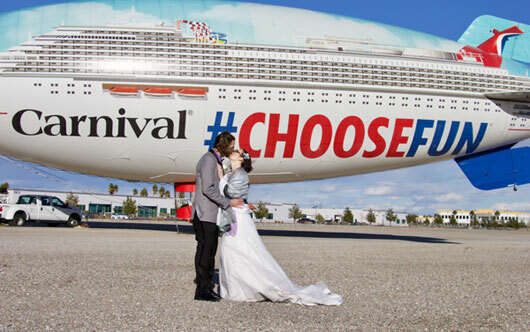 Taking advantage of an “only in Vegas moment,” Carnival Cruise Line’s #ChooseFun AirShip hosted its first-ever wedding for Amanda Robertson, 32, and Jason Gerken, 37, from Las Vegas, who tied the knot aside the colourful, 128-foot-long blimp. With close family and friends in attendance, Las Vegas’ own Henry Sneed of Lucky Little Wedding Chapel officiated the memorable ceremony with an appearance by “Elvis Presley.” The couple and their family were invited to spend their honeymoon on Carnival Panorama which debuts in Long Beach, Calif., in December.